The wife was browsing beef recipes on Google. 'Everyone is cooking beef. Even Shobhaa De is making beef curry today,' she said. 'I don't care about the menu at the De residence,' I replied. 'Today is Sunday. It's gotta be dhansaak. It's what all true-blue Parsis eat on the Sabbath. With a chilled London Pilsner to go along'. 'Nothing's changed' I said. 'I will fight for her right to cook whatever she pleases in her plush Cuffe Parade kitchen. I just don't want it on my plate,' I said. 'Will the world come to an end if you eat beef curry instead of dhansaak on one Sunday? Why do you have to be such a xenophobe?' the wife asked, visibly agitated and yet covertly pleased at her refined vocabulary usage to call out my culinary bigotry. 'Bubba do you even know the reason behind Shobhaa's new-found penchant for beef?' I asked. 'It is in solidarity with the Akhlaqs. It is a symbol of defiance against the Hindutva extremists, not a fad like the Paleo Diet that you're eager to jump onto. Peek out of your South Bombay cocoon once in a while and look at what's going on with the rest of the country. People are being lynched on pretext of eating the wrong farm animals. The religious fascists are taking over.' I said. 'I don't know about Chikungunya, but yoga could solve the Syrian crisis within a week,' the wife proclaimed. 'Sure! If only we could beam Ramdev's TV show to Assad's war-room,' I said sarcastically. 'Why do you condemn a benign, peaceful philosophy because of a few crazies gone astray?' she inquired. 'How come you never say the same thing when I rant about Islamists & anti-choice Christian nut-jobs? Or when I defend cartoonists attacked for drawing You-Know-Who?' I countered. 'Everybody knows THAT is religious terror. THIS is different' said the wife, stressing on the demonstratives. 'How is THIS different?' I asked. 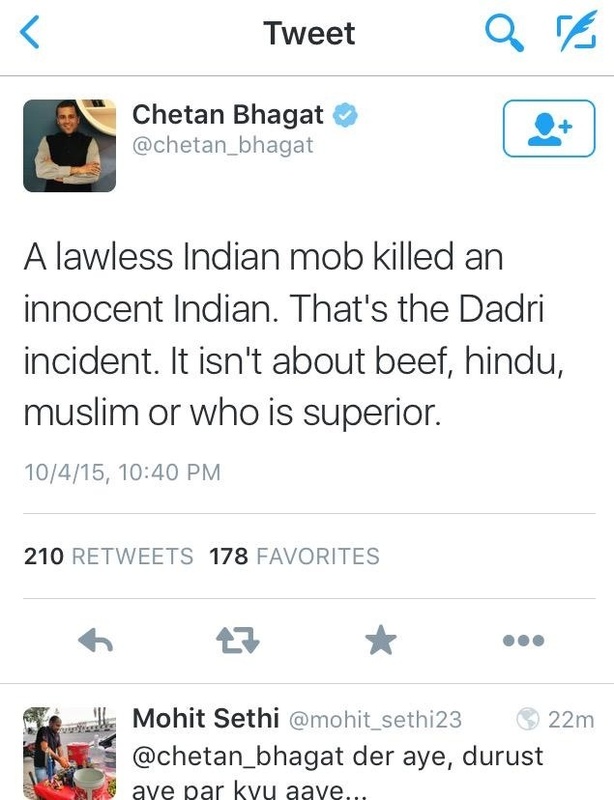 'It's different because Chetan Bhagat says so!' -the wife said with an air of finality. 'You are only jealous coz he's an IIT graduate and not a "regular engineer" like you,' she mocked. 'Of course! We don't want to offend sentiments by cooking the wrong sort of curry' I concurred, trying hard to look solemn, while slowly nudging Orwell's 1984 paperback underneath the Sunday Times, until it was out of the wife's sight. You never know who turns out to be a "closet Bhakt" these days.